In my own perfume collection, certain houses receive more attention during certain seasons of the year. Diptyque happens to be a summer favorite of mine: I've worn L'Ombre dans L'Eau every summer since 2003, and I'm also very fond of Eau Rose and Eau de Lierre. Diptyque's latest release, Florabellio, puzzled me on paper, and I wasn't able to guess how much I'd like it or what season it would best fit. 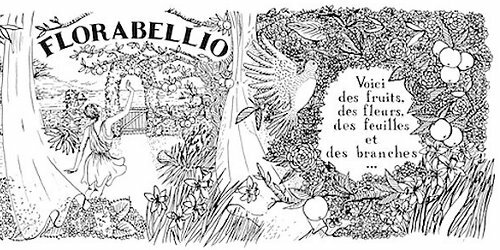 Florabellio was developed by perfumer Fabrice Pellegrin and features notes of salty sea spray, sea fennel, apple blossom, osmanthus, coffee and toasted sesame. My sample vial of Florabellio has turned out to be a very suitable fragrance for the earliest days of summer. Diptyque describes Florabellio as "foreign yet familiar...blurring the perspectives between land and sea, flower and fruit, softness and bitterness." Most of that description makes perfect sense to me (we'll get to the other part in a minute!). Florabellio opens strong and yes, almost bitter, with its coffee accord. I happen to love the smell and taste of coffee, and this coffee aroma has hints of vetiver and something malty, making it complex and almost "masculine." The coffee gradually dissipates, allowing Florabellio's "salty sea spray" to dominate. This is the softer (but still androgynous) phase of the fragrance; it's fresh, but also just slightly vegetal, with a hint of seaweed (the "sea fennel"?) lurking beneath the salt and the cool air. I've worn Florabellio several times this week, almost draining my sample vial, but I'm still searching in vain for the "flower and fruit" in this quirky gourmand-marine scent. There might be a suggestion of osmanthus's peachy-suede effect in the dry down, which reminds me of warm, slightly musky skin under a veil of sand and salt. Somewhat surprisingly for a fragrance with so much airiness, Florabellio clings well to skin; a few spritzes to my wrists and neck left a layer of scent that was still detectable at the end of a full workday. It could easily be worn by men as well as women (despite the flowery name). I've known for a while that I'm fond of breezy salt-air fragrances like Lostmarc'h Iroaz, Les Parfums de Rosine Ecume des Roses and Tokyo Milk Sea and Sky. I never thought I'd like a marine scent with a coffee note — in truth, the idea of a marine-coffee fragrance never even occurred to me — but now that I'm smelling one, I love it. In addition, the juxtaposition of ocean air and almost-bitter coffee brings back a happy childhood memory for me. I certainly wouldn't mind owning a small bottle of Florabellio for this summer. 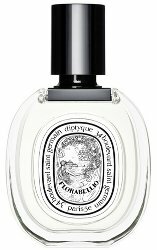 Diptyque Florabellio is available as 50 ml ($90) and 100 ml ($125) Eau de Toilette. For purchasing information, see the listing for Diptyque under Perfume Houses. Great review Jessica and I had the exact same thoughts about Florabellio. I wasn’t sure about it at first but kept being drawn back to it to the point that I bought a bottle. I have several other summery sea air fragrances but find this one to be unique from the others. It wasn’t what I expected at all — I was prepared for more FLORAls, and for the coffee to appear much later in the base. Like you, though, I’ve been trying and re-trying it and getting pulled back. I too seem to be drawn towards Diptyque scents in summer. I’ve almost drained by large decant of Eau de Lierre and I have a whole host of Eau samples from them to throw in my beach/gym bag. I also love salty scents. I find a hint of salt in Granville by Christian Dior, Bronze Goddess by Estee Lauder and that new Jo Malone the salt/sage one…I can’t remember the name now. However the coffee note can be tricky. MANY times it kills a scent for me. The Black Vetyver Cafe by Jo Malone just irks me to no end. And so does Santal Noble by Maitre Parfumeur et Gantier (and I am a BIG sandalwood fan) and it’s whiff of coffee. Blech. So I must admit trying Florabellio sounds risky for me. Ah! I knew there was another sea-salt-air fragrance I forgot to mention! It was the Jo Malone. Thanks! Great review, thanks. I was fully expecting this to have a strong apple note. I’m glad to hear otherwise. Your coffee plus sea spray description reminds me of the Olympic Peninsula in WA with it’s little roadside espresso stands. Coffee aroma with hints of vetiver? Sign me up. I was just raving the other day about my new copperhead shampoo bar which has a vetiver mocha thing going on. It smells so good. I love that Washington reference! I can see how that would work, definitely. I sniffed that Copperhead shampoo bar in LUSH and I really liked the smell, too! Oh, did you ever get your hands on the rose jam one? I have to say I was skeptical about solid shampoo but I’m definitely a convert. You know, I did buy one, and it crumbled into bits on the way home. Such a shame. I exchanged it for a small bottle of Fair Trade Honey shampoo! Being a Washingtonian stuck in Maryland, your comment makes me want to try this immediately. I really, really like it. It’s just “different” enough, yet it seems to meld with my skin in a really pleasing way throughout the day. Of course, some people will find it weird, and some will find it boring — but tastes always vary! True enough. I like the idea of coffee and sea air because it sounds like it combines safety and adventure! A bit like being snug in bed when there is a storm outside. Whether it will evoke this feeling for me is a different matter! Thanks for the review, Jessica. I might have skipped over this based on the name. Your description made me think of childhood summers at my Nana’a lake cottage along the NY/Canadian border: breakfast with very light coffee in the bay window overlooking the lake, followed by playing in the sand. Childhood bliss. My memory is very similar! It’s an odd combination for a fragrance, but Diptyque makes it work. Hope you’ll be able to try it soon and like it — maybe even love it! Yes hopefully I will like it and save some money, since I was saving for a bottle of Zegna Haitian Vetiver that is $200! Oh my. I don’t know that one, although I do like Zegna’s menswear! I’m a quite infatuated with Javanese Patchouli. Luckily a friend told me it smells awful, which at least gives me pause. I have some pricey perfumes that I know the wider public will not enjoy, but at that price it does make me hesitate! I was so puzzled when I tried it, as I could not smell any floral notes at all – glad to hear it’s not just me. That puzzlement also distracted me a bit, I didn’t pay much attentiont to what WAS going on, focussing so much on the absent flowers. But it’s haunting me now, I’ll go back and ask for a sample. No, I really don’t think it’s just you! I went into a Diptyque boutique, sprayed it on a blotter, and stood there looking puzzled..sprayed some on my wrist, and stood there looking puzzled…and then a kind SA offered me a sample vial, which I was grateful to have, because I thought something weird must have been going on with my body chemistry that day. Apparently not! And now I want to try Tokyo Milk Sea and Sky, I love salty notes in my perfume. I sampled this a few times and the first thing I smelled was the fruity apple blossom with the salty marine notes coming in. I noticed the coffee /sesame coming in after and it hovered over the ocean/fruit. To me the overall effect was being at the ocean while wearing a new black leather jacket. I found it interesting but aquatics (calone I think) makes me sea sick It reminded me somewhat of Amouage Reflection. Aw! I have no idea why I like sea-air fragrances so much — they just tap into something deep in my brain and make me feel happy and comforted. I avoid strong sun, so my real-life beach visits are pretty limited!